Nothing in web2py prevents you from using other Ajax libraries such as Prototype, ExtJS, or YUI, but we decided to package jQuery because we find it to be easier to use and more powerful than other equivalent libraries. We also find that it captures the web2py spirit of being functional and concise. // function in web2py.js (which is loaded below). 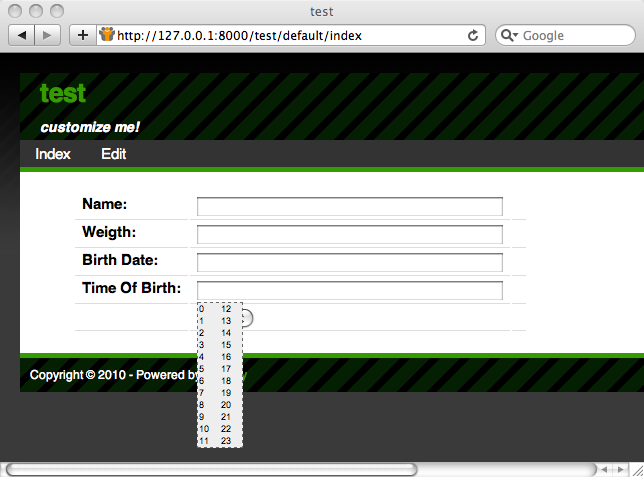 Includes "static/calendar.js" and "static/calendar.css", which are used for the popup calendar. Sets form variables and includes "static/js/web2y.js"
Defines an ajax function (based on jQuery $.ajax). Makes any DIV of class "error" or any tag object of class "flash" slide down. Prevents typing invalid integers in INPUT fields of class "integer". Prevents typing invalid floats in INPUT fields of class "double". 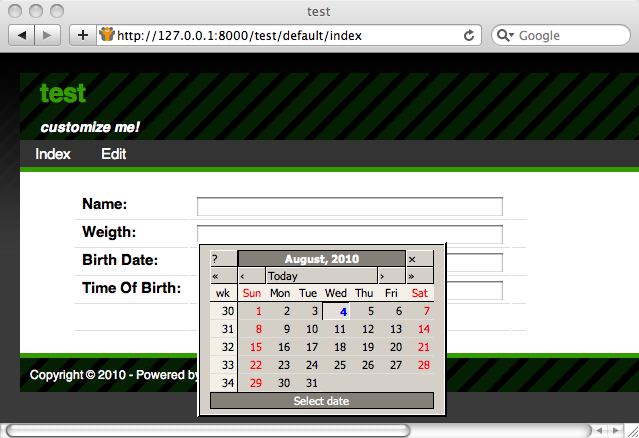 Connects INPUT fields of type "date" with a popup date picker. 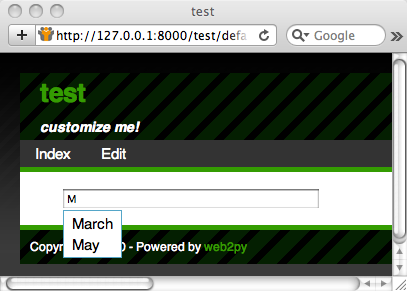 Connects INPUT fields of type "datetime" with a popup datetime picker. Connects INPUT fields of type "time" with a popup time picker. Defines web2py_ajax_component, a very important tool that will be described in Chapter 12. Defines web2py_comet, a function that can be used for HTML5 websockets (not described in this book but read the examples in the source of "gluon/contrib/comet_messaging.py"). It also includes popup, collapse, and fade functions for backward compatibility. Here is an an example of how the other effects play well together. The color of the errors is given in the CSS code in "layout.html". 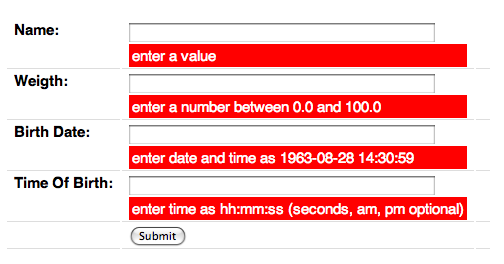 The web2py.js code prevents you from typing an invalid value in the input field. This is done before and in addition to, not as a substitute for, the server-side validation. These and other effects are accessible programmatically in the views and via helpers in controllers. The basic effects described here do not require any additional files; everything you need is already included in web2py_ajax.html. They belong to class "one" and "two" respectively. They have ids equal to "a" and "b" respectively. jQuery('.one')    // address object by class "one"
jQuery('#a')      // address object by id "a"
jQuery('DIV.one') // address by object of type "DIV" with class "one"
jQuery('DIV #a')  // address by object of type "DIV" with id "a"
Effects return the calling object, so they can be chained. When the click sets the callback function to be called on click. Similarly for change, keyup, keydown, mouseover, etc. The body of the unnamed function is executed only when the document is ready, after it has been fully loaded. The speed argument is usually "slow", "fast" or omitted (the default). The callback is an optional function that is called when the effect is completed. jQuery is a very compact and concise Ajax library; therefore web2py does not need an additional abstraction layer on top of jQuery (except for the ajax function discussed below). The jQuery APIs are accessible and readily available in their native form when needed. Consult the documentation for more information about these effects and other jQuery APIs. The jQuery library can also be extended using plugins and User Interface Widgets. This topic is not covered here; see ref. [jquery-ui] for details. A typical application of jQuery effects is a form that changes its appearance based on the value of its fields. 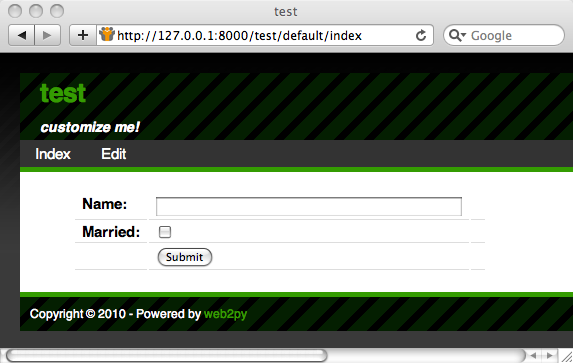 This is easy in web2py because the SQLFORM helper generates forms that are "CSS friendly". The form contains a table with rows. Each row contains a label, an input field, and an optional third column. The items have ids derived strictly from the name of the table and names of the fields. The convention is that every INPUT field has an id tablename_fieldname and is contained in a row with id tablename_fieldname__row. As an example, create an input form that asks for a taxpayer's name and for the name of the taxpayer's spouse, but only if he/she is married. 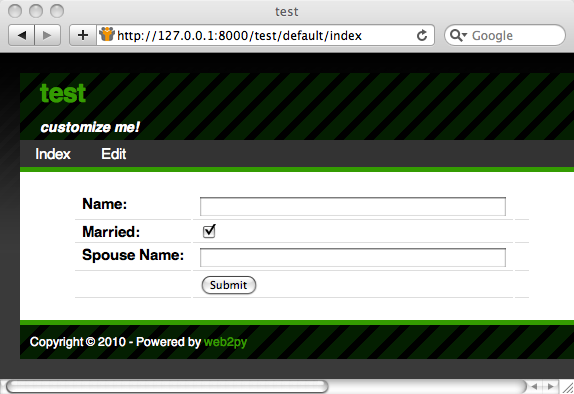 Here "taxpayer_married" is the checkbox associated to the "boolean" field "married" of table "taxpayer". "taxpayer_spouse_name__row" is the row containing the input field for "spouse_name" of table "taxpayer". Another useful application is requiring confirmation when checking a "delete" checkbox such as the delete checkbox that appears in edit forms. and the corresponding view "default/edit.html"
The deletable=True argument in the SQLFORM constructor instructs web2py to display a "delete" checkbox in the edit form. It is False by default. In web2py.js, web2py defines a function called ajax which is based on, but should not be confused with, the jQuery function $.ajax. The latter is much more powerful than the former, and for its usage, we refer you to ref. [jquery] and ref.[jquery-b]. However, the former function is sufficient for many complex tasks, and is easier to use. It asynchronously calls the url (first argument), passes the values of the field inputs withthe name equal to one of the names in the list (second argument), then stores the response in the innerHTML of the tag with the id equal to target (the third argument). When you type something in the INPUT field, as soon as you release a key (onkeyup), the ajax function is called, and the value of the name="name" field is passed to the action "echo", which sends the text back to the view. The ajax function receives the response and displays the echo response in the "target" DIV. The third argument of the ajax function can be the string ":eval". This means that the string returned by server will not be embedded in the document but it will be evaluated instead. This allows for more complex responses that can update multiple targets. Web2py contains a built-in autocomplete widget, described in the Forms chapter. Here we will build a simpler one from scratch. Another application of the above ajax function is auto-completion. Here we wish to create an input field that expects a month name and, when the visitor types an incomplete name, performs auto-completion via an Ajax request. In response, an auto-completion drop-box appears below the input field. jQuery provides an optional Auto-complete Plugin with additional functionalities, but that is not discussed here. Here we consider a page that allows the visitor to submit messages using Ajax without reloading the entire page. Using the LOAD helper, web2py provides a better mechanism for doing it than described here, which will be described in Chapter 12. Here we want to show you how to do it simply using jQuery. It contains a form "myform" and a "target" DIV. When the form is submitted, the server may accept it (and perform a database insert) or reject it (because it did not pass validation). 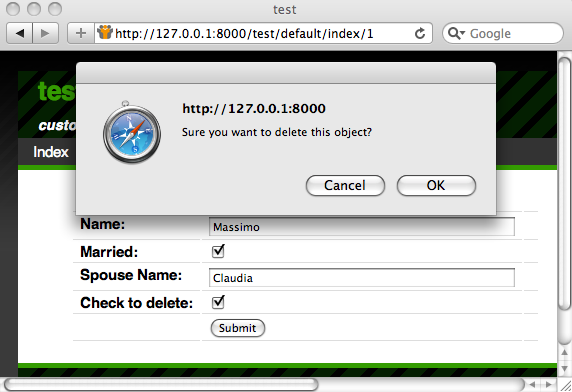 The corresponding notification is returned with the Ajax response and displayed in the "target" DIV. Notice that each post has a single field "your_message" that is required to be not-empty. The first action does nothing other than return a view. The second action is the Ajax callback. It expects the form variables in request.vars, processes them and returns DIV("Message posted") upon success or a TABLE of error messages upon failure. Notice how in this example the form is created manually using HTML, but it is processed by the SQLFORM in a different action than the one that displays the form. The SQLFORM object is never serialized in HTML. SQLFORM.accepts in this case does not take a session and sets formname=None, because we chose not to set the form name and a form key in the manual HTML form. 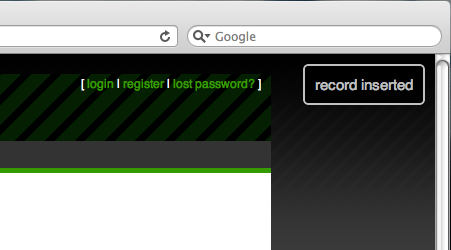 The script at the bottom of the view connects the "myform" submit button to an inline function which submits the INPUT with id="your_message" using the web2py ajax function, and displays the answer inside the DIV with id="target". Another Ajax application is voting or rating items in a page. Here we consider an application that allows visitors to vote on posted images. The application consists of a single page that displays the images sorted according to their vote. We will allow visitors to vote multiple times, although it is easy to change this behavior if visitors are authenticated, by keeping track of the individual votes in the database and associating them with the request.env.remote_addr of the voter. The download action is necessary to allow the list_items view to download images stored in the "uploads" folder. The votes action is used for the Ajax callback. Ajax callbacks can be used to perform computations in the background, but we recommend using cron or a background process instead (discussed in chapter 4), since the web server enforces a timeout on threads. If the computation takes too long, the web server kills it. Refer to your web server parameters to set the timeout value.